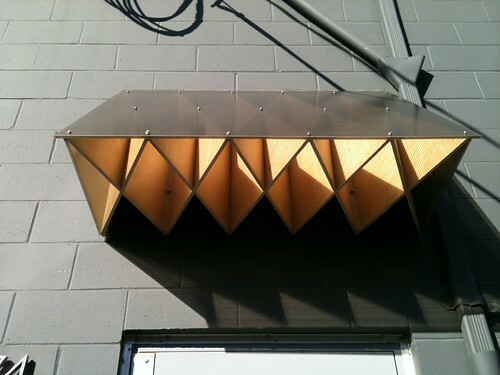 Beautiful canopy by Robert Kleyn for Catriona Jeffries Gallery, Vancouver. The design of this canopy is clever not just because it’s a visually interesting addition to an otherwise aggressively plain warehouse, but also because it effectively deflects wind in what is an exposed windy laneway. And it has worn very well – it’s been up there for a while now. Vancouver writer William Gibson with BC artist Ron Terada’s “Big Star.” Photo: Candace Meyer, all rights reserved. A number of Vancouver’s most high-profile cultural figures have spoken out recently about the British Columbia government’s recent assault on arts and culture. To read their statements, click here or on the image above.